For Visaka births of a masculine valence, the condition of prosperous, preaching, inclusive, broad-scope, philosophical, humanistic Brihaspati may considerably affect the outcome. Masculine births under auspice of Puna, Visaka, or Purvabhadra may find that their worldview is greatly shaped by the character of priestly teachers and guides. father: reputed to be a frequently alcoholic unemployed who was violent toward his children; yet as a passionate revolutionary socialist he formed a strong ideological bond with his son, who grew to become a bully and ideologue like his political father. mother: reputed to be a devout Roman Catholic, mother of three, and local schoolteacher. Her income sustained the family. 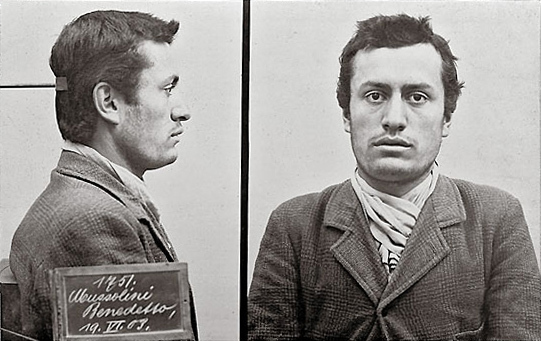 Despite his being a poor student, mother arranged for young Mussolini to obtain a teacher's license so that he would have an income. Chandra + Shani-yuti-Kuja in bhava-8 suggests that she operated under cover. Rohini Chandra + Mangala + Shani = "look at me, desire me"
Mussolini does not have the vital, self-righteous nativity of a world-dominator like genocidal Germany-Nazi 1889-1945 Reichskanzler Adolf Hitler . Unlike Hitler who controlled events until the moment of his (purported) suicide, Mussolini was motivated by his emotional need to be desired = uttama Rohini Soma. The childish attention-seeking results might have been only comical ... if M hadn't destroyed the lives of innocent millions during his nurture-seeking process. His operations were mainly nationalistic (Chandra) localized, and parochially focused on Making Italia Great Again. 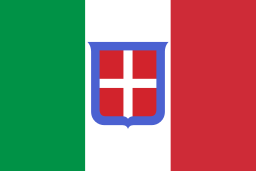 Mussolini's scope remained within the special passions of Italy, with a few conquesting forays into weakened, vulnerable states of the surrounding regions (e.g., Ethiopia, Libya, Albania). Mangala-8 ruler of bhava-2 speech gave Mussolini the power to say whatever was most forcefully provocative of change. He spoke violently, with accountability only to the revolutionary process (8). Mussolini's propaganda machine rivaled Hitler's. Anyone who questioned or contradicted was simply murdered, and people simply accepted the brutality, because Mafiosi violence was embedded in the folk traditions (bandesha-4 Guru in 9. Rahu-1 is ruled by and casts drishti upon atmakaraka lagnesha Zukra-9 multiplied by professorial, priestly, father-figure Guru-9. 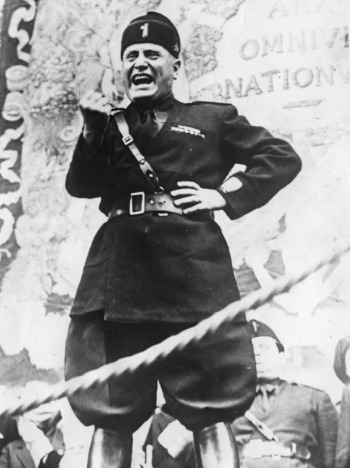 Mussolini appeared to outsiders as a somewhat plumpish, bombastic, primping, self-indulgent sensualist. However he was hugely popular in his homeland which was accustomed to rule by lavishly dressed preaching and proclaiming priestly figures. Women melted their gold wedding rings to send to Mussolini. He was remarkably attractive to women. According to wikipedia, as he gained political power, Mussolini's marital life was characterized by an expedient facade of respectability covering a pattern of lifetime infidelity and multiplicity in his intimate relationships. exchange of vows in marriage-1 * to Ida Dalser in Trento Italy. 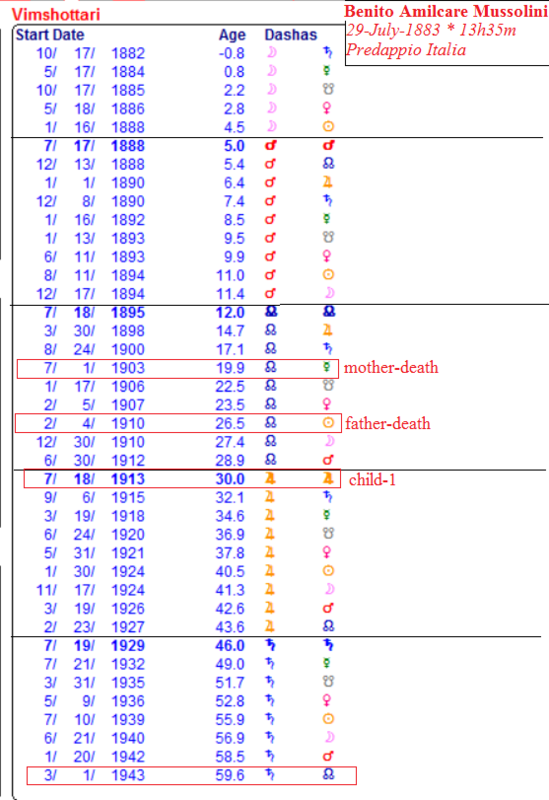 If this marriage did occur, it would have been before 1913 during the chidra-dasha Rahu-Kuja bhukti which would certainly have been a less benevolent time for marriage. 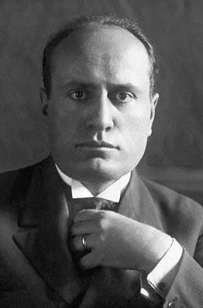 Following Mussolini's political ascendency, evidence of his first marriage was destroyed. Both wife-1 and son-1 were murdered y fascisti government agents. With Rachele, Mussolini had five children. Mussolini had also some well-known extramarital companions, among them Margherita Sarfatti and his final accomplice, Clara Petacci. Furthermore, Mussolini had innumerable brief sexual encounters with female supporters . atamakaraka Zukra + Guru provides an array of feminine companionship. Terrorism was Mussolini's primary strategy. bhava-8 = terror contains Shani-Chandra-Kuja. Shani-Chandra within one degree of orb. 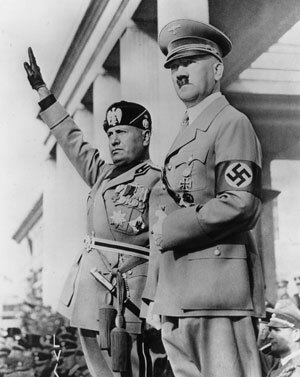 Mussolini's Fascist dictatorship was sustained by some of the most brutal terrorism in modern history. 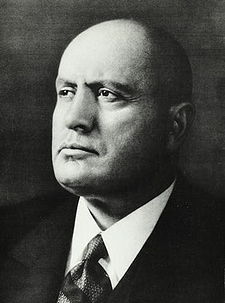 Typical of his cohort of extremely narcissistic dictators during the 20th century, Mussolini was raised with violence and conditioned to be unafraid of it. Nishturabashi yoga indicates the great difficulty of his mother imposing conditions on her love for the boy, rather than offering unconditional love as mothers are generally wont to do. Adults with Nishturabashi yoga having been wounded by mother's refusal to accept the child may become perpetrators of vicious punishment. From a Jyotisha perspective, it could be assessed that Mussolini's core motive was neither social justice nor the advance of civilization nor indeed the welfare of other persons on any level. As compensation for a brutal childhood deprived of parental affection and punished by vicious authoritarian masters (Nishturabashi yoga in bhava-9 sacred doctrine = rogesha-6 slave master Shani), young Benito craved the soothing balm of personal luxury and personal wealth entitlements in massive, limitless, trauma-compensatory amounts. His army was showy and immature; and his political hierarchy brazenly, perversely corrupt. Yet, Kala Sarpa Yoga Ananta * Rahu-1 type of KSY kept him firmly in the grips of vision for a sacrificial transformation of the social order. Shani-Rahu is a notoriously difficult bhukti for most normal people. In Mussolini's case, especially considering the KSY, the difficulties of his 6-8 angle Shani-Rahu quite overwhelmed him. Ketu-7 made it possible for Mussolini to promise (7) anything regarding social equity, claim anything about justice, assert anything about fair distribution of treasury - with no accountability, no transparency, no personal consequences, and no government control. "Q. 48. - Is there Kalasarpa Yoga in [Benito] Mussolini's horoscope ? Ans. There is no doubt Kalasarpa Yoga in Mussolini's horoscope; but the evil is tempered because the planets are hemmed in not between Rahu and Ketu but between Ketu and Rahu. Mussolini has a powerful Sula Yoga (one of the Nabhasa Yogas ), because all the 7 planets are concentrated in the three houses - the 7th, the 8th and the 9th. This is quite unfavourable and will have a very adverse effect especially that Saturn is at present transiting Mussolini's Janma Rashi, in which are placed Saturn and Mars."